636cc of rebellion fueled by three decades worth of evolution of midsize sport bikes leading to winning awards, championships and an unapologetic attitude. 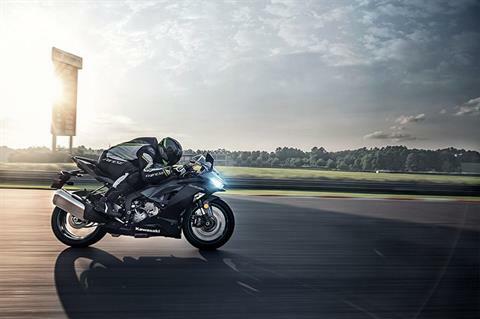 The Ninja® ZX™-6R raises the bar in what it takes to rule the track and run the streets. CONQUER CHICANES: The Ninja® ZX™-6R supersport bike has the championship-proven performance to dissect back-to-back turns on the track with surgical precision. And while its roots are at the track, the exhilaration takes on meaning out on the road. UNI-TRAK® REAR SUSPENSION: Fully adjustable Uni-Trak® rear suspension with progressive damping helps maintain rear wheel traction while putting power to the ground. This leads to confident braking and predictable handling both on and off the track. SUPERSPORT CHASSIS: The pressed-aluminum perimeter frame of the Ninja® ZX™-6R supersport bike boasts a narrow design, allowing the rear to be compact and slim. 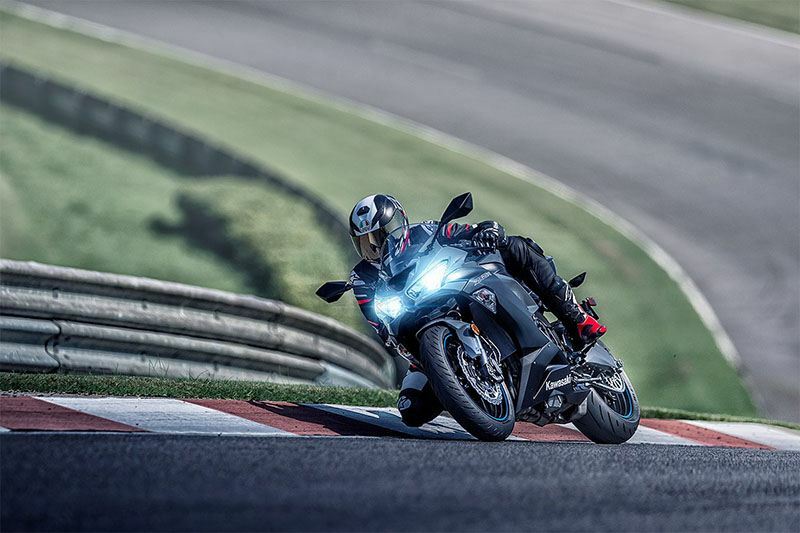 High performance geometry and lightweight construction produces light and responsive handling for street riding, with the ability to change lines on command for track days. SHOWA SFF-BP FRONT FORK: Back-to-back tight turns get straightened out by a Showa SFF-BP front fork that’s fully adjustable and offers progressive damping. 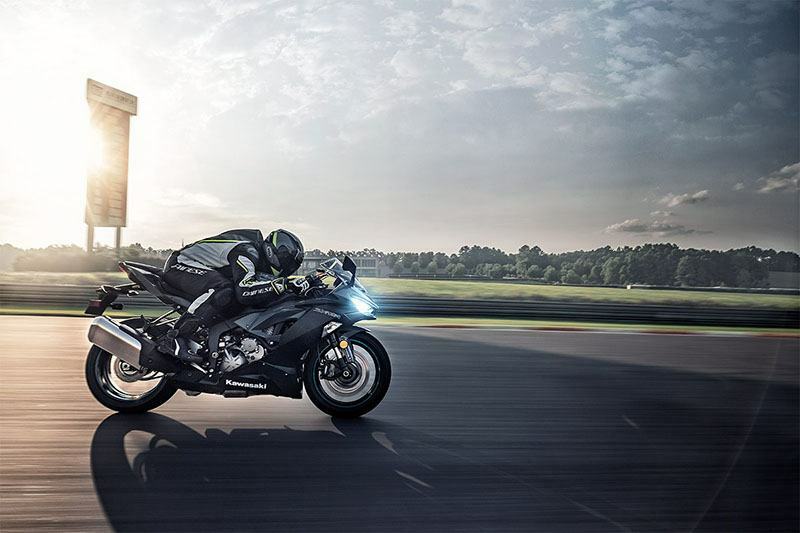 On the streets, this advanced fork combines race-ready performance with everyday usability. On the track, it helps maintain front wheel traction while braking into the chicane and accelerating out. 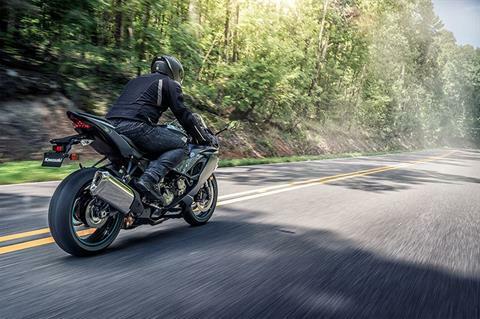 3-MODE KTRC (KAWASAKI TRACTION CONTROL): Adjustable traction control offers three performance settings to choose from to help maintain traction and proper power delivery throughout a wide range of riding conditions from the street to the track. Modes 1 and 2 – Allow a degree of slip to maximize acceleration in high grip conditions. The ideal slip ratio is determined based on real-time monitoring of wheel speed, engine and a number of other parameters to prioritize forward acceleration. 3-MODE KTRC (KAWASAKI TRACTION CONTROL)Adjustable traction control offers three performance settings to choose from to help maintain traction and proper power delivery throughout a wide range of riding conditions from the street to the track. Modes 1 and 2 – Allow a degree of slip to maximize acceleration in high grip conditions. The ideal slip ratio is determined based on real-time monitoring of wheel speed, engine and a number of other parameters to prioritize forward acceleration. 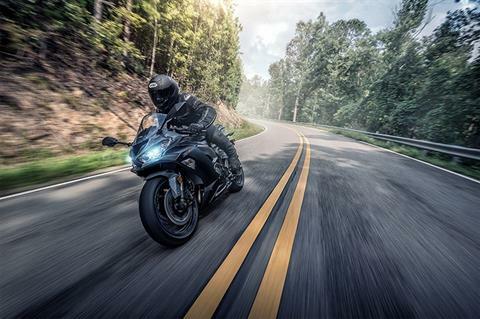 MASTER THE HAIRPIN: The Ninja® ZX™-6R supersport bike gets ahead of sharp turns with optimized engine performance across the entire rpm range, class-leading components, and advanced rider support technology. BRIDGESTONE BATTLAX HYPERSPORT S22 TIRES: Experience greater confidence, lighter handling and, ultimately, more thrills when you take command of sharp turns with superior grip in a variety of conditions. ERGONOMICS: A supersport seat works with a slim and flared fuel tank, making it easier to grip the tank with your knees. A adjustable clutch lever with five available positions allows you to modify the position of the lever to suit your preference. 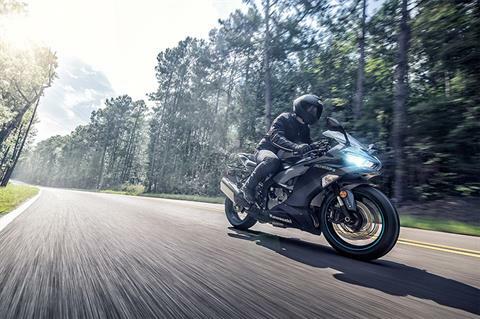 OVERCOME ELEVATION: On or off the track, stay grounded and in control when taking on elevation changes with the race-inspired power, performance and technology of the all Ninja® ZX™-6R supersport bike. ASSIST AND SLIPPER CLUTCH: educes back-torque when excessive engine braking occurs to help maintain a high speed through turns in order to enter an uphill climb with optimal momentum. LEGENDARY 636cc ENGINE: A digitally fuel injected inline-four cylinder engine works with a shorter final gear ratio to further emphasize torque and low-end power, translating into more exhilaration on the street and windy roads, and the ability to accelerate quickly and pull hard up inclines. KAWASAKI QUICK SHIFTER (KQS): This highly reliable contactless-type quick shifter enables ultra-quick upshifts at full power for seamless, maximum acceleration on or off the track. When the shift lever has been activated, the system sends a signal to the ECU to momentarily cut ignition so that the next gear can be engaged for clutchless shifting. 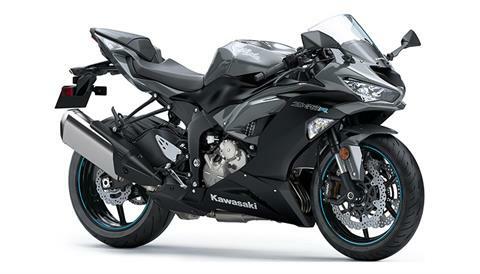 RIDE IN STYLE: The Ninja® ZX™-6R supersport bike gets fresh styling inspired by the larger displacement Ninja® ZX-10R motorcycle with sharp and edgy lines that stay true to the iconic Ninja® image. FRONT COWLING AND WINDSCREEN: An all front cowling and windscreen design represents the next step in the evolution of Ninja® motorcycles, creating more distance from the competition. LED HEADLIGHTS: Each LED headlamp features a position lamp alongside low and high beams that produce increased brightness. TAIL COWL: Overlapping and interwoven design elements and the upswept lines of the tail cowl gives off a sharper appearance. LED TAILLIGHT: The LED taillight inspired by the Ninja® ZX™-10R motorcycle adds a sophisticated, high-grade touch to the rear of the bike. 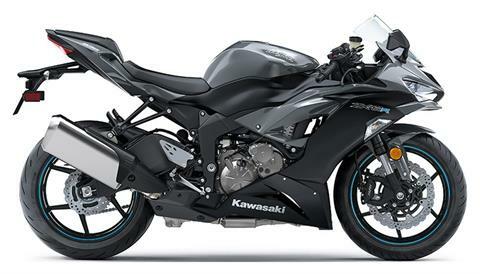 MUFFLER: Features a finishing treatment and a designed end-cap, adding to the sporty look of the all Ninja® ZX™-6R supersport bike. 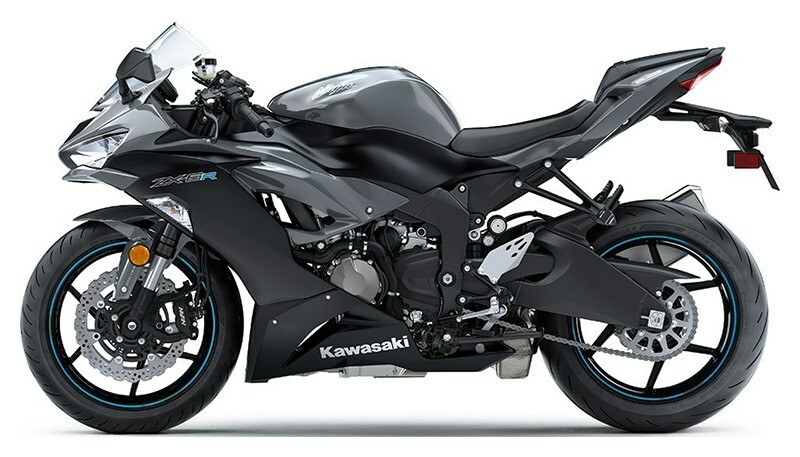 HEEL GUARD: All heel guard design complements the bike’s dynamic lines.